anatomy + The NotWedding Philly; Sneak Peek! 7We had to share our favorite photo from The NotWedding Philly! We had such a blast ! 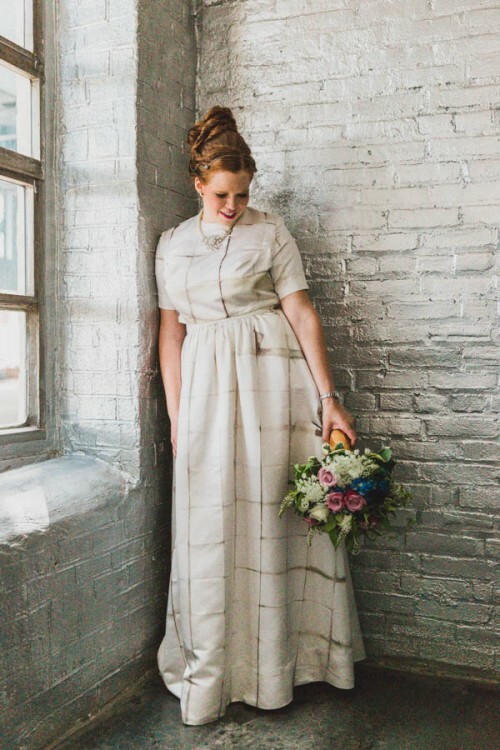 We made Amanda (the bride) look ultra modern and chic in our Opal and Harper styles! Of course, we had to make it fit in with the theme of the wedding, so we hand dyed the duchess satin in the traditional Shibori style! We folded the fabric into small squares, then compressed the stacks with blocks before submerging it into the dye bath. The blocks prevent the dye from reaching what’s underneath it, leaving an outline of squares! We love how faded it looks in some areas in contrast with the geometric nature of the print! It’s so modern and fresh, like a retro spin on a modern, cropped top silhouette! The look was polished off perfectly with some help from our friends, Peg’s Hardware and Bella Belle Shoes! We can’t wait for the full blog post on Ruffled blog next week!! And we’ll be in the next NotWedding in NYC come September! We can’t wait to party again!